Old fashioned pickle recipes tend to include alum as a key ingredient. Alum is a chemical compound most commonly found in the form of potassium aluminum sulfate. Alum is added to pickles to create the classic crispness and crunch of a good dill pickle. 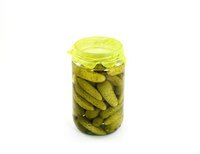 The use of alum for pickling is less common now because, while approved as a food additive, it has been deemed unnecessary in the pickling process. That said, alum continues to be used as a crisping agent in many favorite pickle recipes. Wash the cucumbers thoroughly and add to the large mixing bowl. Dissolve the powdered alum in your small cup by pouring enough water over the powder to create a thin paste. Pour the six cups of water over top of the cucumbers. You may need a little more water if your cucumbers are larger than average. Your aim is to completely cover all of the cucumbers in water. Pour the alum paste into the cucumber bowl and mix thoroughly to incorporate. Allow the mixture to soak overnight. In the morning, strain the pickles from the liquid, pouring all of the water out of the bowl. Discard the alum water. Rinse the cucumbers under running water to remove the alum solution. Using your vegetable scrubber, scrub each cucumber to remove any remnants. Follow your favorite dill pickle recipe from the beginning using your crisped cucumbers. Using alum in the final pickling liquid is not recommended. If you do decide to soak your pickles in alum, be sure to remove all traces after soaking with a thorough wash and scrub.